Enjoy some fresh beer at Ska Brewing or play cards in this sad wet tent. Tough decision. 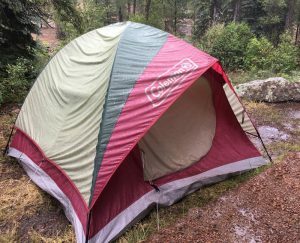 Two days ago I returned home from the annual week-long camping trip I take with my father and the stack of camping equipment is just about dry. Due to a wild fire in our usual spot in southwestern Utah, this year we ended up in Durango, Colorado. 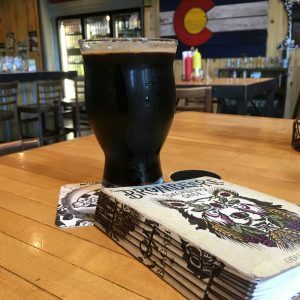 One of my favorite places in the country, mostly for the beauty of the mountains, rivers and forests, Durango is also home to Ska Brewing, one of the coolest little breweries in the state. After being out in the mountains since Sunday, we drove into town on Wednesday morning. 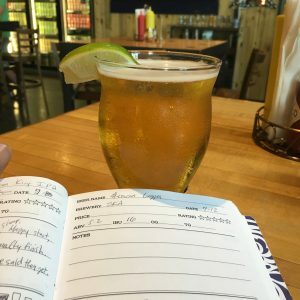 The goal was to restock out supply of ice and a few other necessities that didn’t hold up so well in the almost-daily monsoon downpour, and after a brief shopping trip, we ventured over to Ska Brewing for an early lunch. Not much of a beer person, I had to coax my father into Ska with the promise of a tour of the facility, which, unfortunately, I had to renig on. I found out, immediately after we sat down, that the tours are only run at 4PM, albeit every day. I could have looked this up on the Ska web site, sure, but since we camp about 10 miles from any cell signal I was kind of flying blind. And since it was 11 AM, and as much as I would have liked to stay dry and happy with a beer in my hand for five hours, it just wasn’t going to happen. Ska has one of the coolest (and on-brand) taprooms around. Inside is Food Container, which is a modular restaurant add-on to the taproom constructed of reused shipping containers. You can get amazing brick oven-fired pizzas, fries, sandwiches, etc, and eat it right there in the brewery. I ordered some of the pub chips to go with our beers, as we had a finished off a stack of huge pancakes as a late breakfast at the campsite and weren’t very hungry. I started with the Mexican Logger, Ska Brewing’s cerveza equivalent. Not normally one to put a lime in my beer, I decided “when in Rome” and went with it. The beer was crisp and refreshing, deserving of the awards garnered at the last few Great American Beer Festivals. I really wanted to try brews I can’t get in Arizona, so next I ordered the Steel Toe Stout. This creamy, dark beer is more my speed, and didn’t disappoint. Also offered on Nitro, but I went with regular strength version of the brew. Notes of coffee and a little sweetness made this a great beer to sip while contemplating the local art. Turns out, I’m an idiot, and we can get Steel Toe Stout here in AZ. Apparently, just not where I’ve been looking for it. I finished up with a Decadent, which, yeah, we can also get in Arizona, but since dad was driving and this was likely the last place I was going to have access to a flush toilet and hot water that didn’t involve starting a fire for the better part of a week I wasn’t in a big hurry to leave. Oh yeah, and take the damn tour.